Christine Benning from England Athletics presented Fleet and Crookham AC with their Club Mark Certificate. We all enjoyed Hotdogs, CAKE and lots of celebrating. 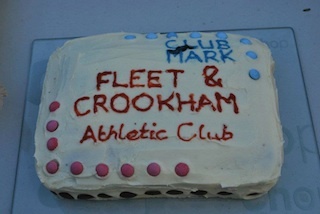 Congratulations to everyone involved as Fleet and Crookham AC have been awarded Clubmark. Details of presentaion are to follow. A big "Congratulations" to our club runners who took part in the London Marathon today. 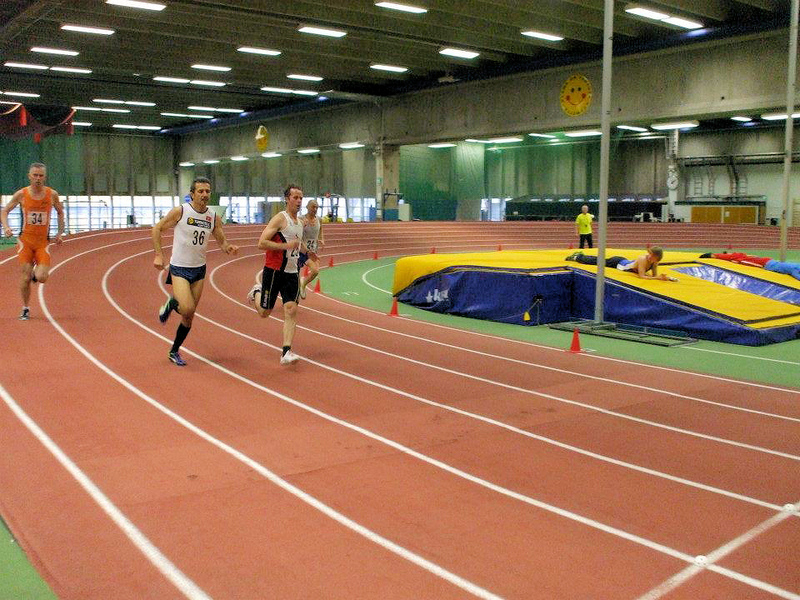 Last weekend, John Dickinson and Andy Smerdon competed in the World Indoor Ultra Multievents Championships in Helsinki. Tempted by the possibility of a UK-hosted double decathlon in the summer, we figured this would be an ideal pre-season warm-up. The event, known as the Tetradecathlon, comprises two days of competition with seven events each day. It was held at an excellent indoor arena, just 20 minutes tube ride from Helsinki centre. However, the two hour time difference and 8 am registration meant an uncomfortably early start on day 1. The event began relatively gently with a 60m sprint. As it was my first event under IAAF rules, I was taken aback by the starter’s ruling that I could only use a crouch start if I used blocks, or otherwise I’d have to take a standing start. So I quickly arranged some blocks to be in about the right place, and went on to set a personal best, leaving me for the only time during the weekend leading my age group. Next was the long jump, and then the hard work started, with an 800m, followed by shot put and 400m. I’d only run 800m once before, and both track events were unfamiliar on the tight 200m oval. The differences between John’s recent track practice and my lack of training were starting to show, as he met his targets, and I just managed to keep ahead of my worst-case scenario. After the high jump, only the 3000m remained to close out day 1. I put on my brand new distance spikes, set my stop watch, and pounded 15 times around the track to finish in my target time. When I stopped, I realised the error of my ways, as my calves had taken a severe beating. I should have stuck with trainers as there were still another seven events to complete. Back at the hotel that evening, I knew what to do. Athletes always have an ice bath. Well I thought ice was taking things a bit far, so I filled the bath with cold water and stood in it, ankle deep, for about 20 seconds, before the pain of being in Helsinki’s cold water got the better of me. Surely a little hot water wouldn’t go amiss. Finally I lowered myself in and sat and shivered for 10 long minutes before the cold and a growing hunger forced me out. I’d been to Helsinki several times on business before, and recalled past drinking marathons that ended with me tipping beer into plant pots to pretend I was keeping up. However, a night out with ultra athletes was quite different: I couldn’t keep up with their food intake! As the plates of pasta and chips were consumed, there was talk of burgers and minibar snacks to round up the evening, and I had to retire early to recover for the next day. Day 2 was always going to be hard. I survived the 60m hurdles not only intact but with another PB, but then turned in a personal worst in the pole vault. 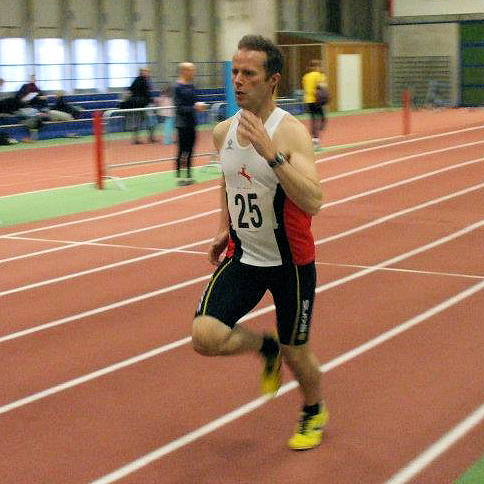 My personal highlight was the 1500m. I set out to lead the race with a time in mind, and had a fantastic boost when, after three or four laps, the commentator announced “Great Britain are in first and second positions” at which point I knew that John was on my heels, and could als experience the pride of running for Great Britain! Unfortunately a lap later he took over the pace, and I couldn’t quite hang on to him for the finish. Then came the weight throw. The weight is a bit like a hammer, but twice as heavy at nearly 16kg. Competitors happily stood within a few metres of the throwers, with no cage in sight, as a variety of techniques were used to haul the ball and chain into the throwing area. Sadly I realised too late that this event required some serious practice, and turned in three pathetic efforts. With fingers crossed, I started the triple jump with calves screaming. I hoped one jump would be enough, but I wasn’t happy with the result. As John collapsed in pain the pit after a bad landing, it looked for a moment that it would all end in tears for him, though he had achieved the distance he was looking for. I pressed on and finally achieved my third PB of the competition on the last jump. Fortunately John’s knee was still working, and my legs had held out. A mere 5000m now stood between us and our first tetradecathlon finish. After a lonely run turning out 25 stopwatch timed laps, and finishing only a few seconds short of my outdoor PB, it was all over. Sadly neither of us won medals, but John came within 100 points of the previous world record and broke the 400m and 800m event world records. Unfortunately for him, there was a titanic battle between two other Brits in his age group, with the world record being smashed by Andy Waddington from Basingstoke and Brian Slaughter from Eastbourne finishing a close second. After the awards ceremonies, we all hobbled out to the tube and winced painfully down the station steps, reflecting on a brilliantly organised event, our own personal achievements, and all planning to return in a year’s time. A big thank you to everyone who helped last weekend (including our Juniors) and a big well done to those who ran - I hope you had a good day. As a club I think we can again be very proud of ourselves - it was a great day. There will be a few things we can continue to improve on but from feedback I have had so far, I believe we did ourselves proud. If as runners you noticed anything on the course we could do differently - let Penny know. I will be asking the organising team exactly the same and we will put it all towards making next year even better.